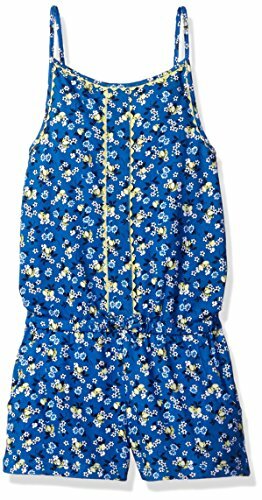 Scout + Ro Big Girls' Romper Scallop Detail, Strong Blue, 7 | What Should I Say? An Amazon brand - This Scout + Ro floral romper features ric rac trim and an elastic waistband with faux tie. Scout + Ro by Amazon offers fun-forward, fuss-free kids' clothing in comfy fabrics that are easily matched and look great wash after wash. If you have any questions about this product by Scout + Ro, contact us by completing and submitting the form below. If you are looking for a specif part number, please include it with your message.